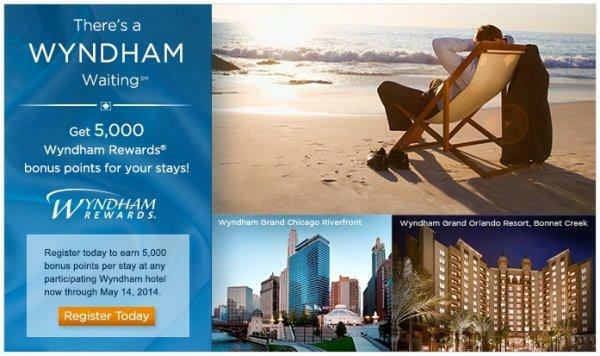 Wyndham Rewards has a new promotion for stays at participating Wyndham Hotels between February 12 and May 14, 2014. You can earn 5,000 bonus points per stay. You need to register for this promotion before your stays (do it here) and you can access this promotion on Wyndham’s web page here. Wyndham Rewards has a separate promotion for double points that runs from now till March 21, 2014 (access here), that should be combinable with this offer. This is nice 5,000 bonus points per stay for those that don’t mind doing bit hotel hopping around. To qualify for the “Wyndham Spring 2014 5,000 Bonus Points” promotion (the “Promotion”)and earn 5,000 Wyndham Rewards points, the Wyndham Rewards Member must (i) be an active member and register for the promotion by clicking here or 1-866-996-7937, (ii) book a stay at any of the hotels participating in the Promotion (the “Promotion Hotels”) at a Qualifying Rate between February 12, 2014, and May 14, 2014 (the “Promotion Period”) and complete their hotel stays by May 21, 2014. For a full list of Promotion Hotels, click here. Members will receive 5,000 Wyndham Rewards points for each of their Qualified Stays within the Promotion Period at any of the Promotion Hotels with a maximum of 3 rooms per stay. Member stays with check-out dates after May 21, 2014 will not receive the 5,000 bonus points. One stay includes all consecutive nights at the same hotel regardless of check-ins or check-outs. No shows do not qualify for the 5,000 bonus points. This Promotion is subject to cancellation or change without notice. Rates offered by most online travel agencies and certain other rates do not qualify. Members who have elected to earn airline miles or rail points in their member profile will not be eligible to earn the 5,000 bonus points in this Promotion. Members should allow six to eight weeks after completion of the Promotion for the bonus points, to be credited to their account. Void where prohibited by law. Full Wyndham Rewards Program terms and conditions apply and can be found at http://www.wyndhamrewards.com/terms. Capitalized terms used in these terms and conditions without definition have the meanings ascribed to them in the Wyndham Rewards Program terms and conditions.